What factors might explain the lower rate of use of anti-retroviral therapy among MTF transgender persons in this sample? 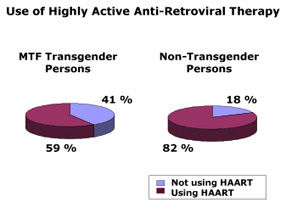 Given that a significantly smaller percentage of the MTF study group used HAART, what might explain the similarity in HIV-related health status in the study and control groups? What other health disparities might this HIV-positive MTF transgender sample experience aside from decreased anti-retroviral therapy utilization?